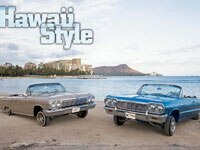 Cruising In "Paradise" With Two Of The Islands' Cleanest Impala Ragtops. 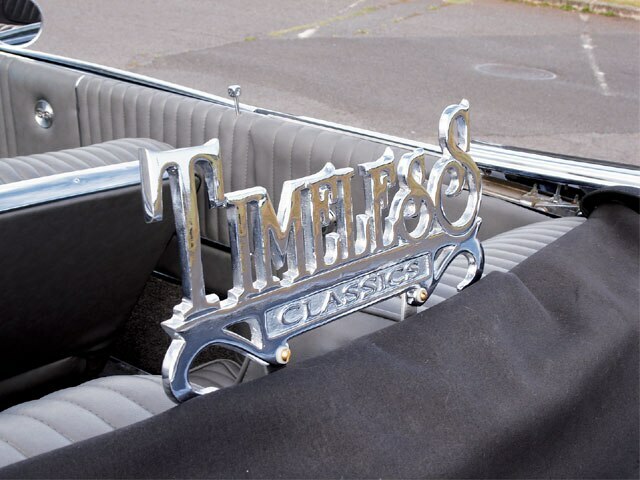 Cruising “paradise” in style is an understatement for this pair of Timeless Classics C.C. members. During a recent visit to Hawaii, Jimmy Galam and Wilson Montemayor were ready to show us how they roll, along with the rest of their club. So off we went to the perfect location for a photo shoot. 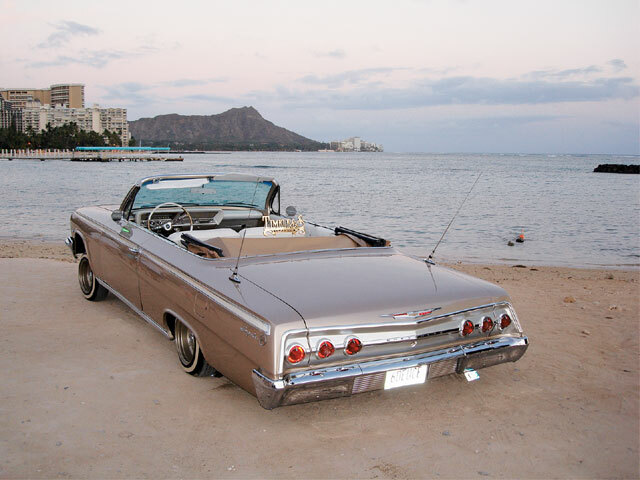 Along the way, the duo enjoyed a cruise along the famous beaches of Waikiki with Honolulu’s Diamond Head as a backdrop. We spotted the first car, Jimmy’s ‘62 Chevy Impala convertible, at a local car show. 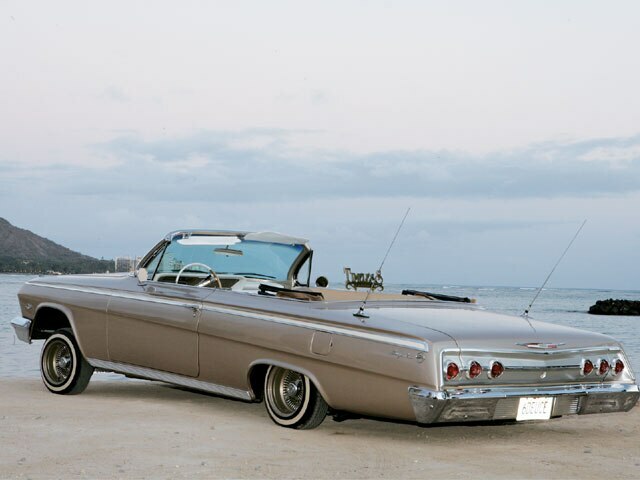 Jimmy has owned a few rides, including a ’64 Impala SS, before building the ragtop. 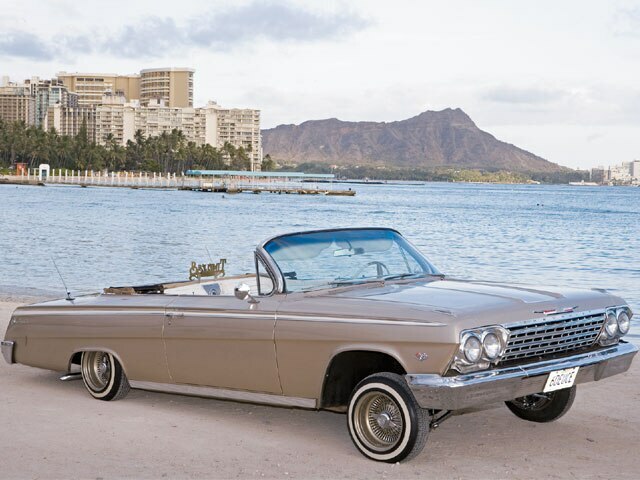 He originally got into the ’62 when he was seeking to start another project, this time a convertible (a hot commodity in Hawaii). It’s been about three years and counting for the “6Deuce” build. 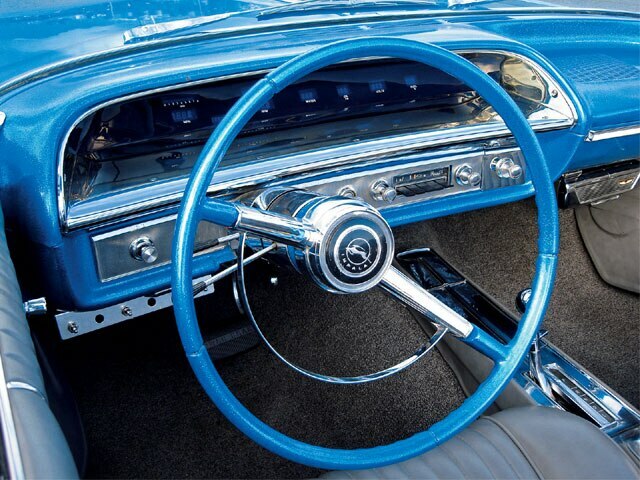 When Jimmy bought this Impala, he never thought that he would go through the complete car. 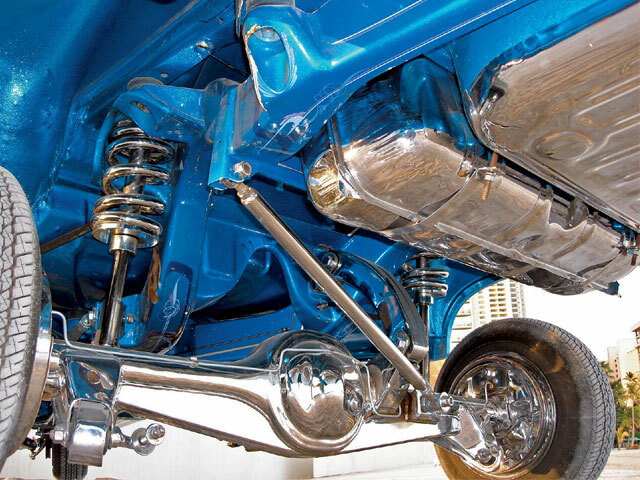 Next up for this work in progress is to “chrome out” the engine and install a entirely new molded chrome suspension from Hoppo’s. 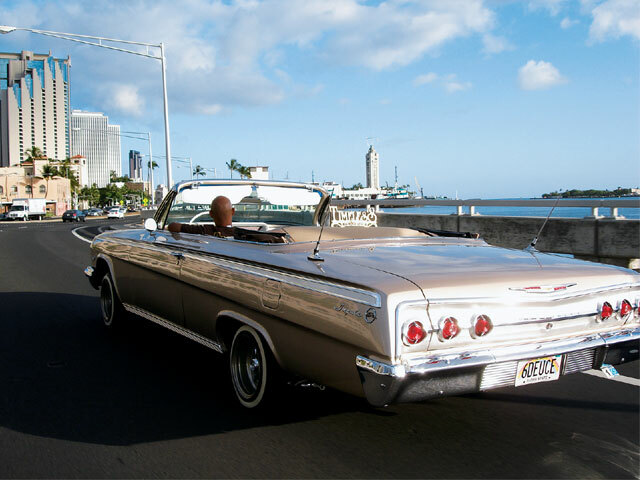 The second car in our Honolulu duo is Wilson’s ’64 Impala convertible. 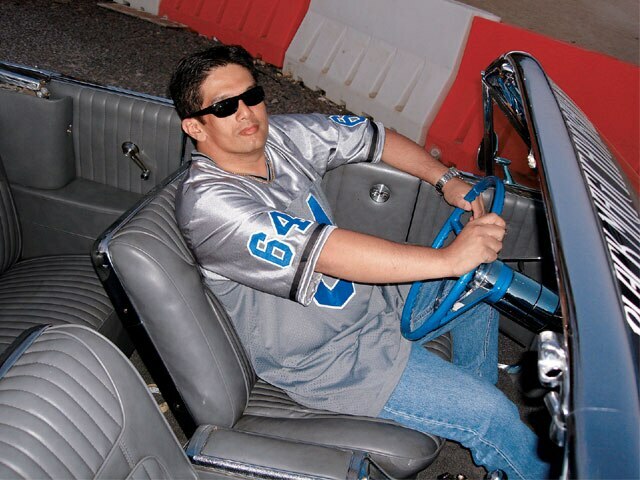 This local lowrider has owned a few cars, including a ’63 SS convertible, ’64 Impala convertible and ’65 SS hardtop, but this time around he wanted to try his luck with a ’64 SS convertible. Unfortunately, when he started to add up the charges, it was going to cost him more to build it himself in Hawaii than it would to ship it over complete from the mainland. Wilson decided to sell off all of his other cars and have this ride be built on the mainland. Wilson had heard that Black Magic Hydraulics in Las Vegas, Nevada, was the place to go if you needed hydraulics, so he called up Ron at Black Magic to see if he knew where there was a car to pick up. Ron told him to try his buddy Shaun Wilson. Shaun happened to have a ’64 SS ragtop, but wasn’t sure if he wanted to sell it. Shaun ultimately agreed to sell Wilson the car, but, as with Jimmy and his ’62, Wilson was told that the car was in pieces. 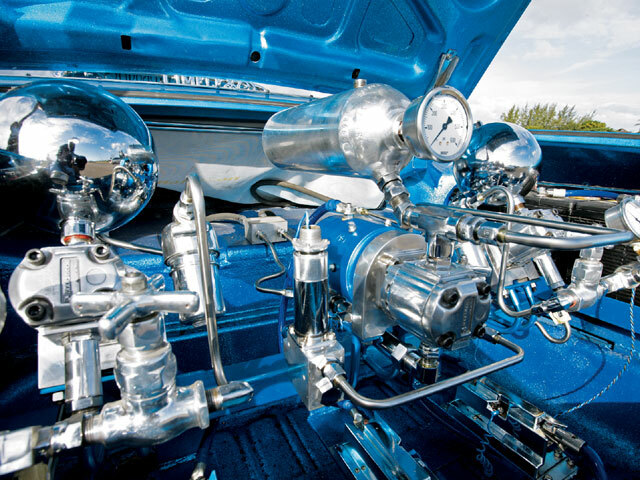 Rather than ship a container full of parts to Hawaii, Wilson struck a deal with Ron at Black Magic, who agreed to put the car together and install one of his custom hydraulic setups. 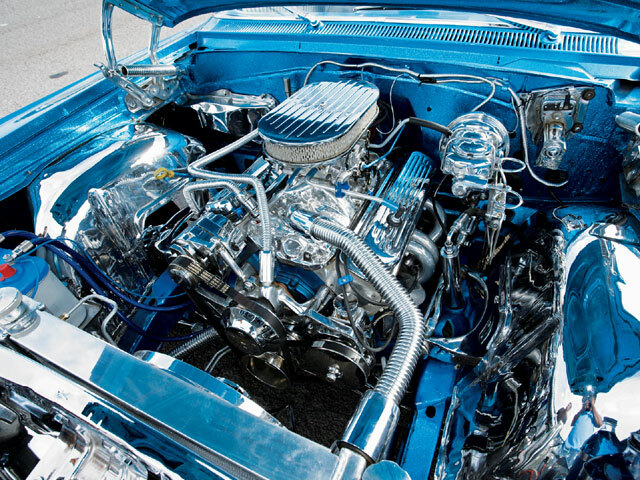 The car was completed within 10 months as the hardest parts of the build had already been done. 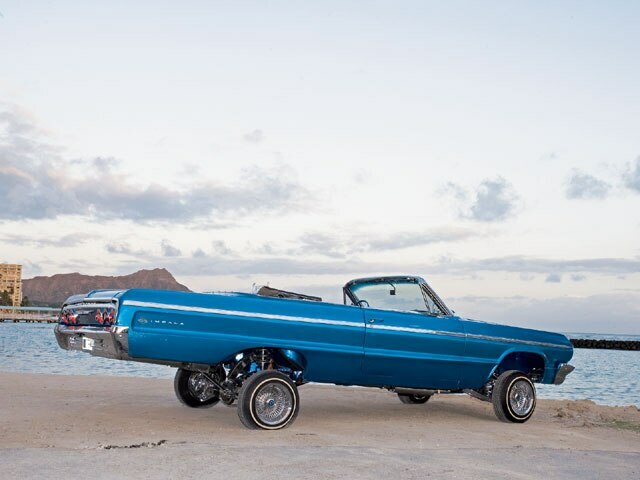 “Blue Magic” is now ready to hit the cruising scene on the beautiful island of Oahu at a moment’s notice. The ’64 has also helped Wilson fulfill his dream of being featured in LRM. 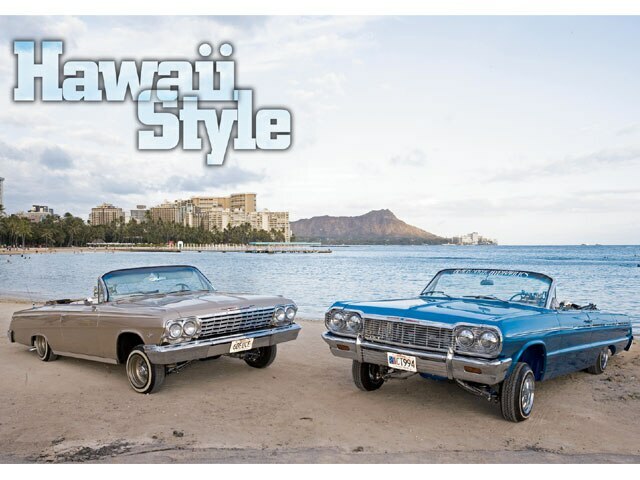 We’re happy to spotlight both of these two clean Hawaiian ragtops. 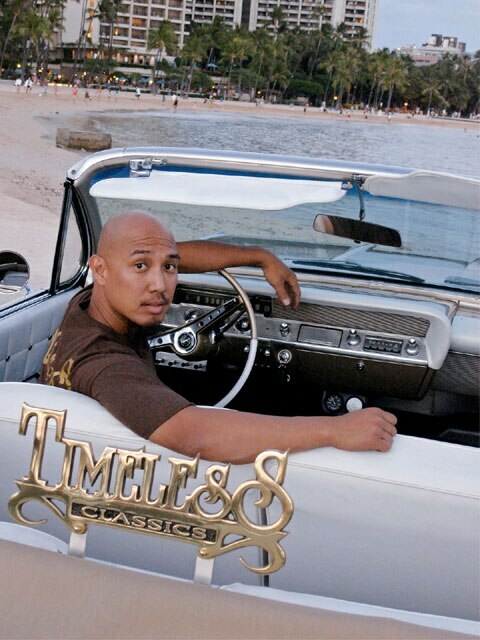 Their appearance just goes to show that lowriders are still rolling in Hawaii. Aloha! Body/Paint: A DuPont fawn finish was applied at Ron’s Auto Body in Hilo, Hawaii. 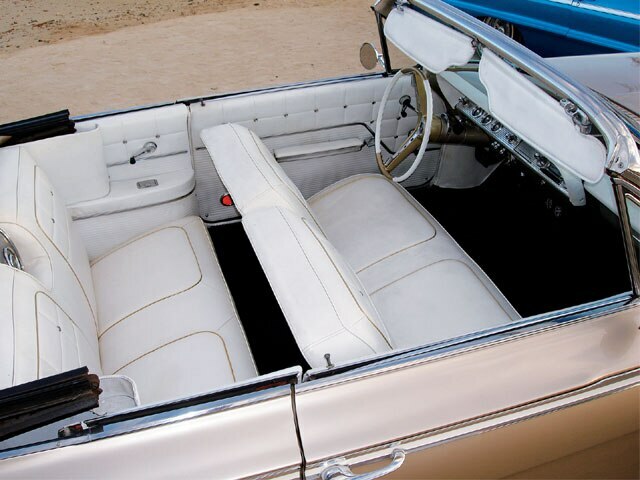 Interior: Al’s Upholstery in Honolulu redid the interior in white with gold piping, and installed a beige Stayfast convertible top. Setup: Steve G. welded the rack that accommodates the hydraulics that were shipped from the mainland. 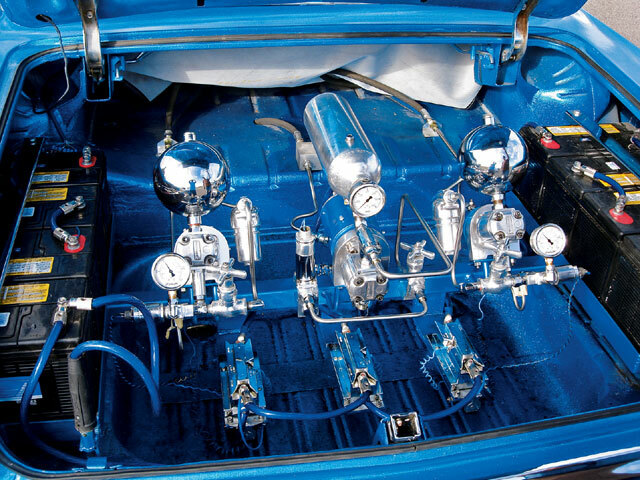 Art and the boys at Hoppo’s Hydraulics in Montclair, California, put together a two-pump, three-dump chrome hydro setup with four switches and six batteries. 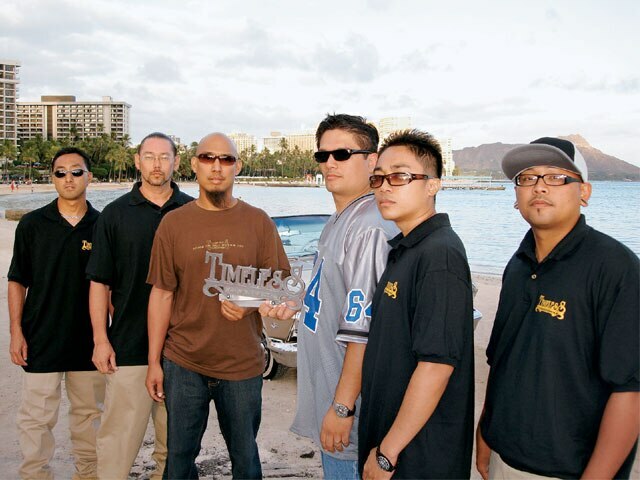 The hydros were installed by Jimmy and his buddy Wes Akamine. 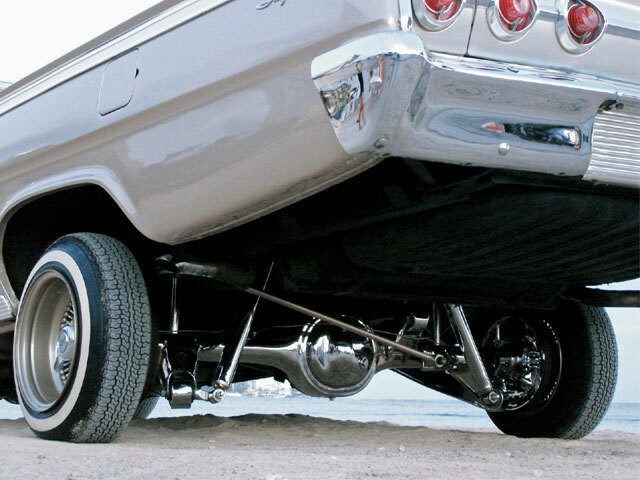 Rudy at West Coast Resurrections in Los Angeles, California, hooked up Jimmy with the chrome suspension parts. 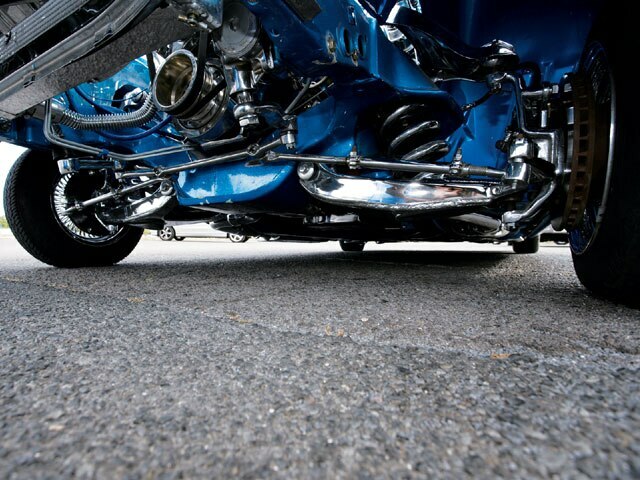 Engine/Drivetrain: A new small-block 350-c.i.d. ZZ4 crate engine and 700R transmission combo was installed and dressed up for show. Interior: Uptown Upholstery in Las Vegas, Nevada, hand made an original-looking interior kit in gray leather. They also get the credit for the Stayfast canvas top. 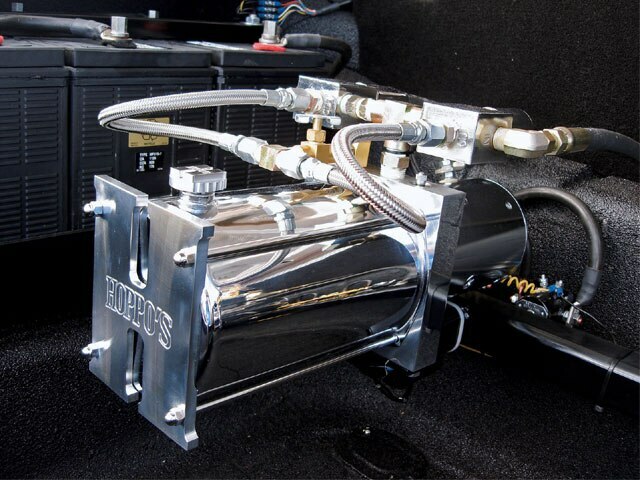 Setup: Ron at Black Magic Hydraulics in Las Vegas put together a custom vintage three-pump setup with Marzocchi pump heads, square dumps, custom blocks, stainless steel tubing and eight 31-series batteries to power up the setup for days.